I was intrigued to read today about how one London school has ended the problem of homophobic bullying – something which has led to an increase in suicides around the world. 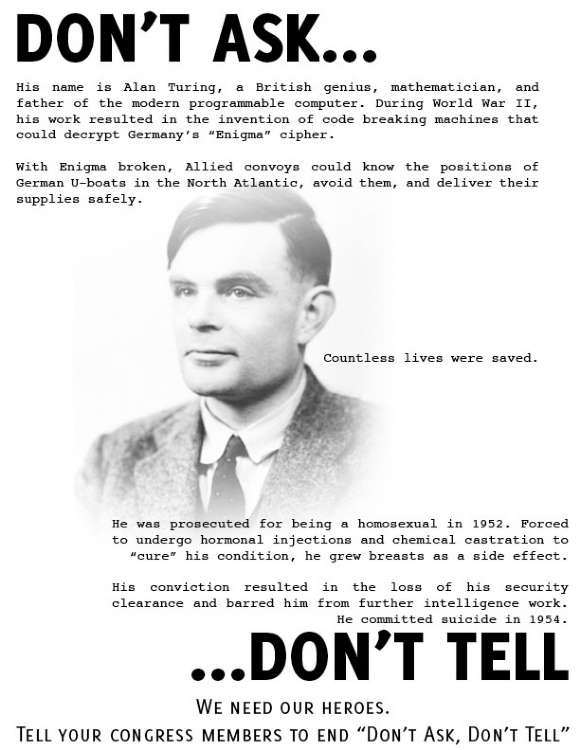 Over the last five years, Stoke Newington Secondary School brought bullying to a standstill by teaching its classes about the wartime code-breaker and father of the computer, Alan Turing. He, Oscar Wilde, James Baldwin and artist Andy Warhol are used as examples of genius damaged by prejudice. The fate of Turing was particularly horrific, and he received a posthumous apology from Prime Minister Gordon Brown. Now the school plans to share the lessons with hundreds of primary and secondary school teachers. By the summer, it will have trained more than a hundred teachers in how to “educate and celebrate” instead of bullying. One side effect is that the pupils have stopped using the word ‘gay’ as a perjorative. Traditionally, young black men from strongly Christian families are the hardest to reach, but this too is changing.